People started to use tattoo very early. Anthropologist are arguing which of the mummies with the tattoo is the oldest: Alpine mummy known as Otzi (3370-3100 BC) or El Moro man (either 4000-1972BC). But the El Moro Man from Chilean Chinchorro mummy is probably the oldest discovered tattoo that may have cosmetic intent: mustaches on the man’s face. Did he claim to be the best first Microblading artist? But when did permanent makeup as we know it today actually started? Who invented it? The industry is silent on it. Some of the best PMU blogs suggest 1970-1980s, one blog published the picture from 1933 article. Wikipedia tells us: “Permanent makeup dates back at least to the start of the 20th century, though its nature was often concealed in its early days. 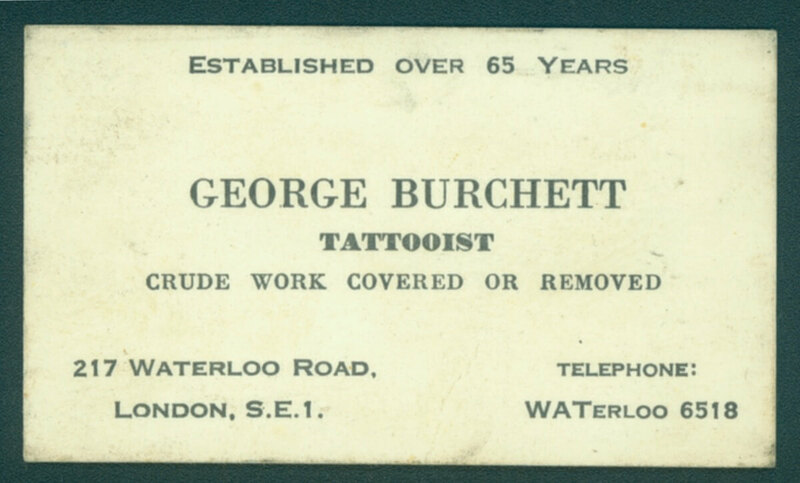 The tattooist George Burchett, a major developer of the technique when it become fashionable in the 1930s, described in his memoirs how beauty salons tattooed many women without their knowledge, offering it as a "complexion treatment ... of injecting vegetable dyes under the top layer of the skin”. We did our research and we do our research good, it's important for us in this book to provide you only with the verified information, separate the myths from the truth. 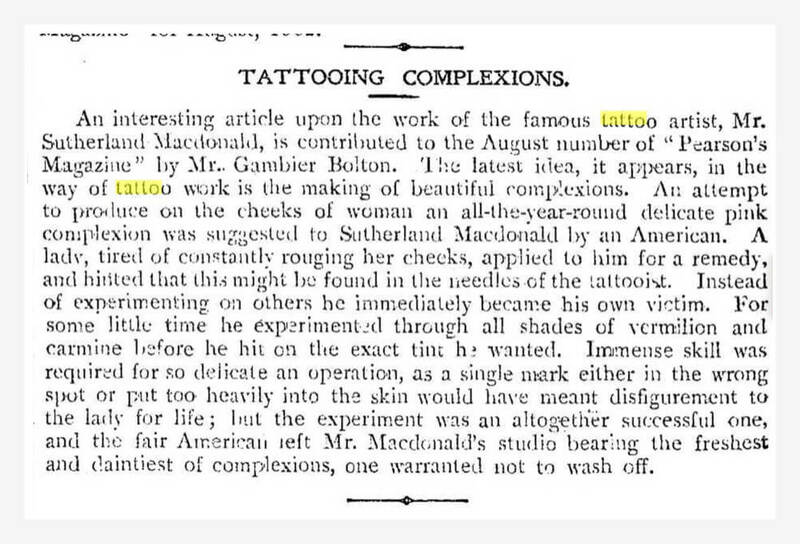 Therefore we can claim that the modern cosmetic tattoo or permanent make up was born in July 1902 in London, and the the inventor was not George Burchett, who is considered by tattoo historians as the best tattoo artist in the world of all time, but another famous U.K. tattooist - Sutherland Macdonald. Location - his studio at # 76 Jermyn Str. The original article about this event was contributed to the August number of Pearson’s Magazine by Mr. Gambier Bolton. And the first PMU treatment suggested was “all-year-round delicate pink complexion” on the cheeks. Interestingly that the idea didn't belong to the tattooist but to the client - an American lady. And she was also the first PMU model documented in the industry’s history. We even know the ink shades used in the first PMU treatment - the mixture achieved after experimentation “through all shades of vermilion and carmine”. Experiment was successful and the first PMU client, “the fair American left Mr. Macdonald’s studio bearing the freshest and daintiest of complexions, one warranted not to wash off”. Well, well. First PMU ad - and first myth started to make its way through to the PMU world - that this “all-year-round delicate pink” is “warranted not to wash off”? Sounds familiar? 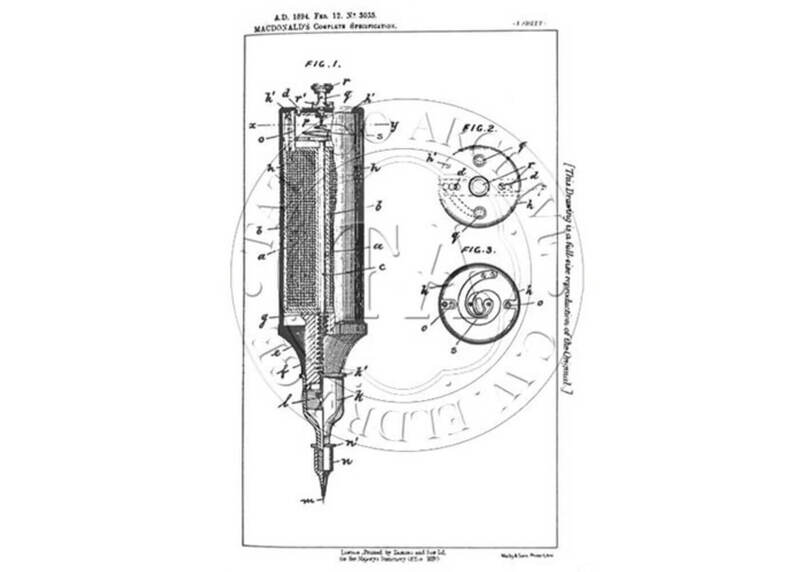 It's worth to mention, that MacDonald got the patent to his machine 6 years before - 1894. 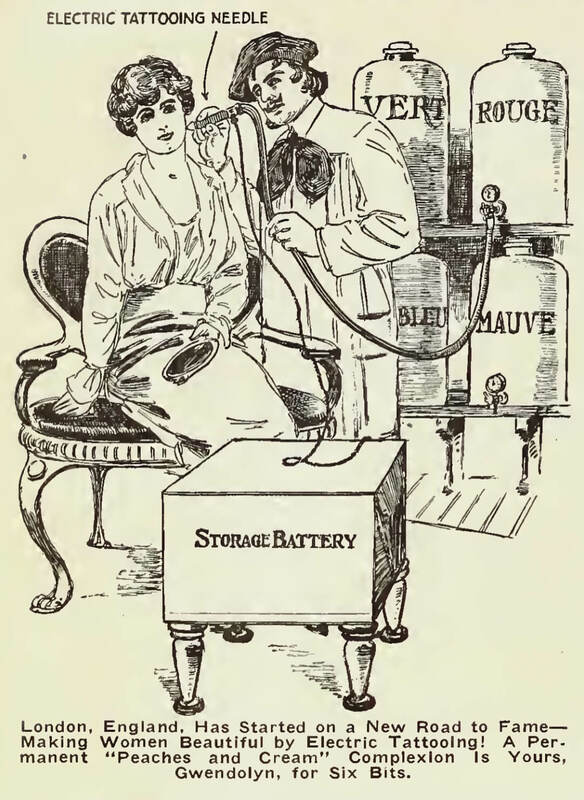 It was considered the best device at that time. And we can assume that the grandfather of all PMU devices was rotary, and even the design of the handheld device didn't change much! For serious art historians reading this: the source is St. Jame’s Gazette, August 1st 1902. I can forward you the copy of the publication upon request but I will appreciate if you respect my discovery and mention reference to my article in your works and publications. Even though the first PMU client and model was an American “fair lady”, it looks like she kept the secret of her “freshest and daintiest of completion” of “delicate pink” to herself, or maybe, in spite of the article promises, the color faded. Who knows now? 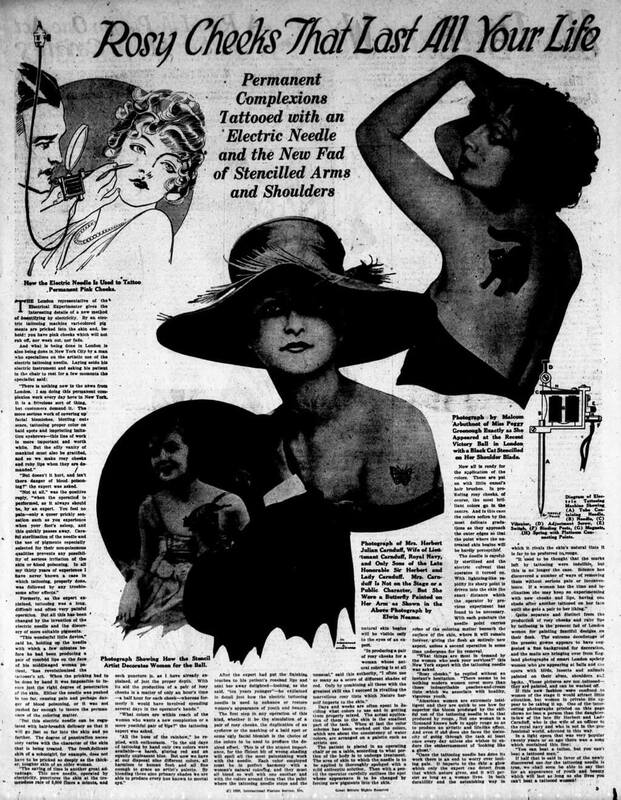 But America, seems didn't discover the new secret until 1919 when Electrical experimenter in its December, 1919 issue placed an article about the new “fad in London” - “electrically tattooing a permanent complexion or blush on the face”. I believe it was the teaser post of the first traveling PMU artist, since it promised “applications can be graduated to suit any physiognomy, and further, that tattooists report that they have never done such a thriving and profitable business among women as now”. Just like what I see every day in the numerous ads on social media! Interestingly, the magazine’s publication authors had no clue how device looked like. They assumed that the pigment got into machine from huge barrels containing inks through a rubber hose. Who knew then that the biggest money in the industry will be done by selling the pigments in a tiny 5-10ml bottles/tubes 100 years later! We can find a lot of facts about how PMU looked like in 1920. The artist used shading technique with fine edge skin blending skill. Most popular treatment was still doing the cheeks though eyebrows, scar concealing, bold spots coverage (first SMP?) 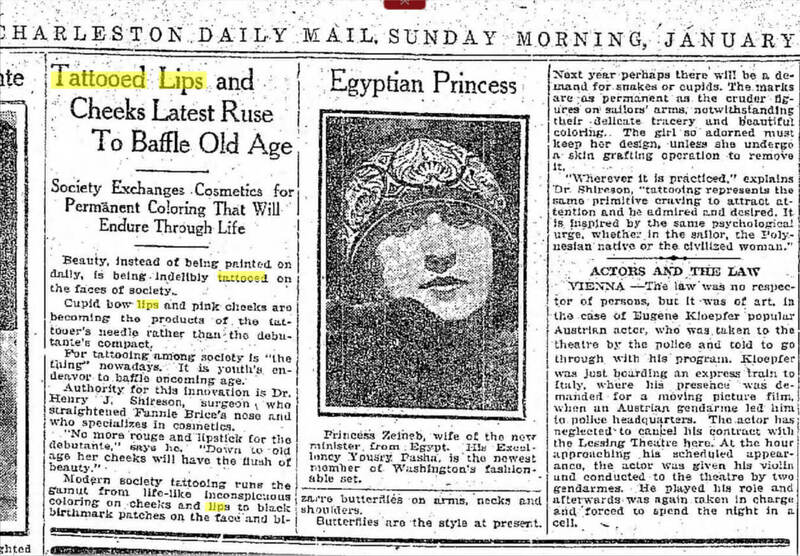 and lips were common procedures. He has substantial choice of pigments, enough to make “all hues of rainbow”, while in “In the old days of tattooing by hand only two colors were available - a harsh, glaring red and an equally unpleasant blue. But now we have at our disposal nine different colors, all harmless to human flesh and all fine enough to grace an artist’s palette. By blending these nine primary shades we are able to produce every hue known to mortal eye”. He knew the concept of pigment-skin matching.”Each color employed must be in perfect harmony with a woman’s natural coloring, and they must all blend so well with one another and with the colors around them that the point where the needles stops and natural skin begins will be visible only to the eyes of an expert”. Very well said! He sterilized his tools. Disinfected the skin before the treatment. Used outline pen too as well as the camel hair brush to sketch the design. Several tattoo removal methods were known and used. Even the concept of nano needle: he called it “hair-breadth delicacy”! Working with the coil machine, with a single needle at the speed of 6000 time a minute (100 per sec), it took him about half an hour for each cheek. He claimed it to be painless, so I assume he used topical anesthetics too. It took three more years, and the new trend started to penetrate to medical offices. It's no longer the exclusive territory of the tattoo artists. Charleston Daily Mail, 27 January 1923 in its Sunday Morning issue placed an article about surgeon Dr. Henry J. Shireson, “who straightened the Fannie Brice’s nose and who specializes in cosmetics”, claiming that his newest innovation - tattooed “Cupid bow lips” and “life-like inconspicuous coloring on cheeks” “to black birthmark patches on the face”. And first truly medical warning that it “will be as permanent as “figures on sailors’ arms, notwithstanding their delicate tracery and beautiful coloring. The girl so adorned must keep her design, unless she undergo a skin grafting operation to remove it”. The doctors were firm already back in 1923 on the efficiency of tattoo removal methods: no saline or acid wash, only grafting! Today they say - only lasers. I believe them. 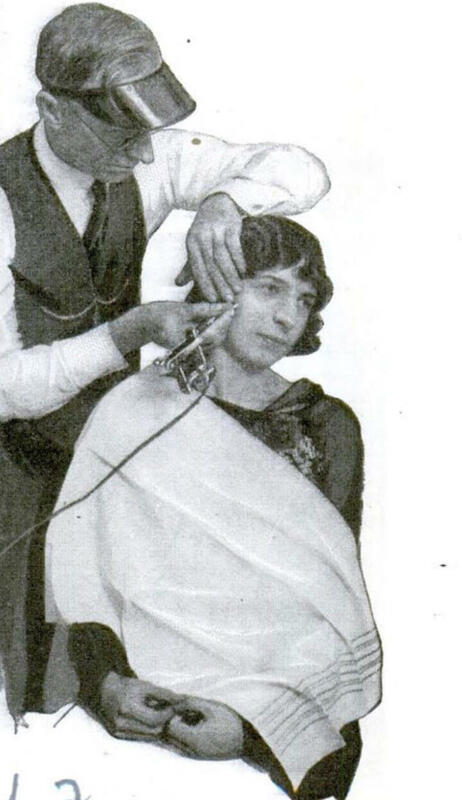 First real photo documentation of the PMU treatment I found in Popular Mechanics from August 1927. Note to the starting artists: please don't learn the method from the image below - always wear gloves! 1. they also did cosmetic tattoo on the dogs noses. Why? In order to bring up the nose color to the contest award winning standards! 2. The price of PMU in 1927 was claimed up to a whopping $300 per treatment! At the time when a 3-bedroom apartment in Manhattan rent was $30-40 and a brand new Ford was $500-600. I wonder was the touch up included? 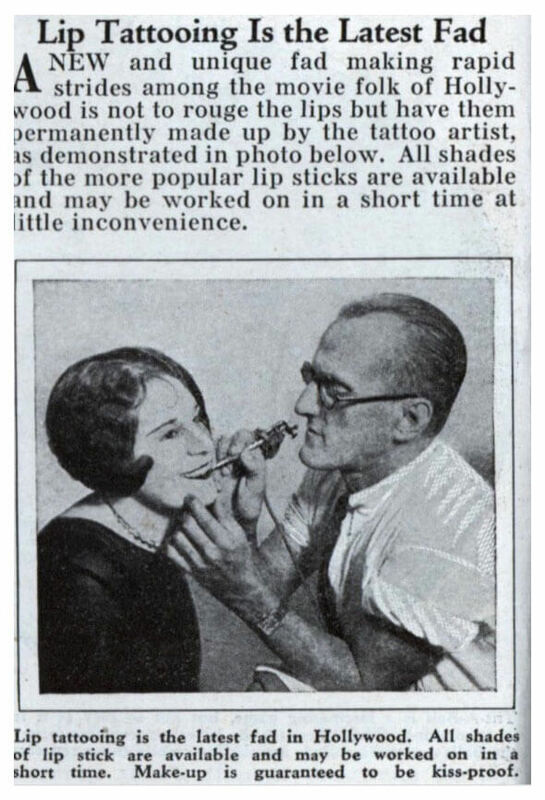 Cosmetic tattooing after 1930s did not get more popularity. Though we find evidence it was practiced by both tattoo artists and doctors. The beginning of modern era permanent makeup trend re-started in the 80s. 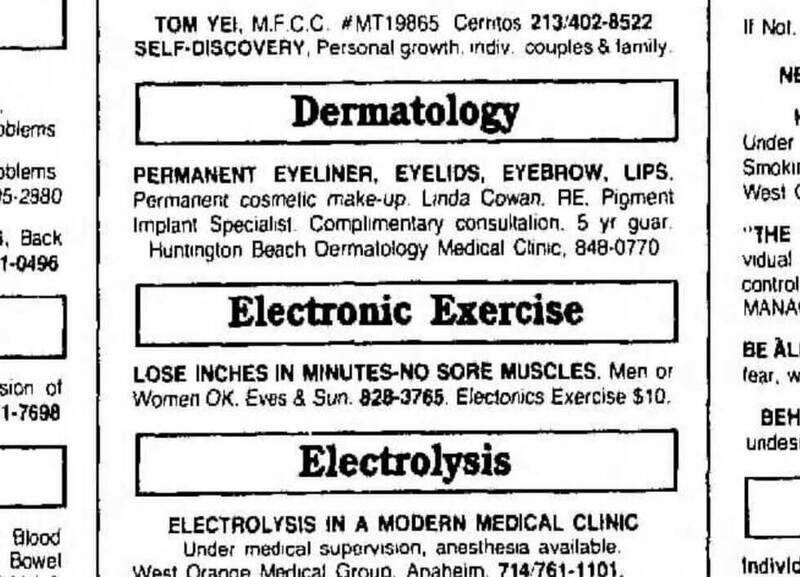 We found this little ad in the Fitness & Health classified section of on April 20, 1986. Linda Cowan from Huntington Beach Dermatology Clinic, called her “Pigment Implant Specialist”, who performs “Permanent cosmetic make-up”. That was the birth of the term PMU and also the reason that the PMU and Microblading artists inherited the terminology mistake: they refer to the substance injected under the skin as “Pigment” vs. correct term “Ink”. Ana Perrone is the only US-based Swiss Color International Instructor that can certify Swiss Color trainers. She is also a Phibrows and Biotek perfection artist. Ana is the owner of Miami Beach Medspa and creator of the Microblading App by Ana Perrone. She is the author of Swiss Color Academy online training course. Rated as number the best Microblading Artist in Miami with more than 80 five-star reviews on Google. André dos Santos, the founder of SCALP55 and SILAM, the first Latin America Simposyum for PMU and microblading. Andre is an editor-in-chief of the SILAM BOOK MAGAZINE. SCALP55 is a company dedicated to scalp micropigmentation and tricopigmentation and to organizing courses and events worldwide. Mechanical engineer by education, Andre also became an International expert on products and new business marketing methods. CEO of BRSales Importação e Exportação in Brazil, Latin American distributor of the leading international brands Organizer and speaker of many worldwide conferences and courses. We created this site for you. We are going to publish the best articles about Microblading as well as the best products and best new techniques. Anyone who has interesting texts or articles, reviews or tips, please do not hesitate to submit to us. We will publish them after verifying the information. Enjoy Best of Microblading!